Back to School at 30? A late bloomer, some might argue, but I beg to differ. A non-traditionalist would be more appropriate. Back in Russia, I graduated from high school at 16, and not wasting an extra minute, I went straight to college to study foreign languages and communications. Well, it seemed like a good idea after the fall of the communist regime and the newly strengthened ties with the West! I admit, this was my Plan B, while Plan A (a musical career), due to a number of factors, had been placed on hold for the entire year.... A year that, to a keen and impatient teenager, appeared endless and felt more like a decade. With no doubt in mind, I walked into the imposing building known as the Moscow State University in early September of 2001, on a beautiful Indian summer's morning, knowing full well that the student life I was about to embrace was no more than a stepping stone with an expiration date of 12 long, but fortunately, adventurous months. Although the two semesters were filled with an immense wealth of new information, interesting opportunities and great deal of fun alongside a wide array of lifelong friends, I'd be lying if I claimed I wasn't counting down the days till the end of my freshman year just so I could get back on the "musical" track. It was a decision I never lived to regret, although there were quiet moments in the years to come when I lamented the fact that I may, most likely, never experience the "classroom environment" and that special sense of student camaraderie I now could only observe and experience vicariously through much younger friends. It was a chapter I had closed a long time ago (by choice) and had gone on to pursue other passions and interests that would prove to open a variety of doors and broaden my horizons in more ways than one. A student of life by nature (and nurture), an insatiable curiosity and yearning to learn never quite abandoned me even through the years when returning to college was the last thing on my mind... That is, until a late summer's evening over a bottle of French wine, sushi and a cross-cultural group of friends on the Upper West Side -- across the street from Columbia University. Call it peer pressure, inspiration or plain kismet, but in the middle of "school talk" (that sounded more like Mandarin to my non-academic ears), it suddenly hit me: if I ever do decide to go back to school, it has got to be now or never. But was it too late to resume my studies now -- at 30? Moreover, would it be possible to juggle a musical career in theatre, with a pending show in workshops, and schoolwork, tight deadlines, stressful exams? 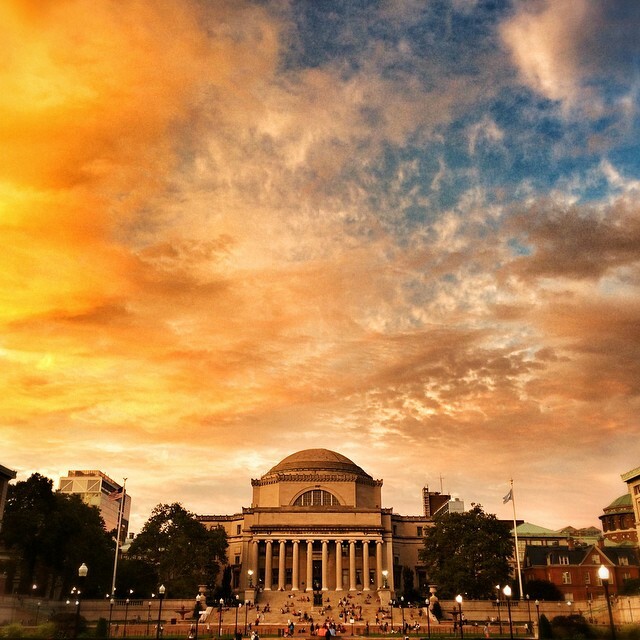 The risk of biting off more than I can chew has always appealed to me, so a generous offer made by a good friend (and a Columbia alum) to set up an appointment with the Dean of Admissions was one I could not and did not refuse. Four months and two consecutive midterm exams later, here I am, typing away at the Butler Library overlooking the iconic Lower Library on a cold winter's afternoon, sat in a reading room filled with eager students, frantically preparing for the final exams that are just days (and in some cases even hours) away. At times challenging, stressful but never boring or uninteresting, this past semester has enriched my life -- and, oddly enough, even my musical career (in no way directly related to my studies in the fields of psychology and Slavic cultures) -- and enabled me to savor these fleeting moments of youth, reminding me time and again that it's never too late to learn and you're never too old to study. With a manic week of review sessions, study groups and final exams to follow, accompanied by endless supply of free pizza, stale coffee and overpriced veggie juices, one fact remains undeniable, day in and day out: This was the best spontaneous decision I ever made.